Accredited Organic Land Care Professionals practice the same vision, principles and expertise used in organic agriculture with landscape management. Accreditation courses are held each year. See the training schedule here. The Standards for Organic Land Care handbook has been nationally recognized as a model for sustainable landscaping practices. 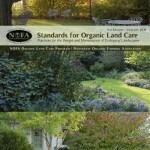 To order the book, “Standards for Organic Land Care,” click here. Review the Standards and Accreditation program for professional organic landscapers, property managers and homeowners here. Find an Accredited Organic Land Care Professional near you here.